We are both totally impressed with these steak knifes !! ( even the hubby and he's picky ). They come in their own black wooden storage box which is great for us since I totally lacking on storage space here. 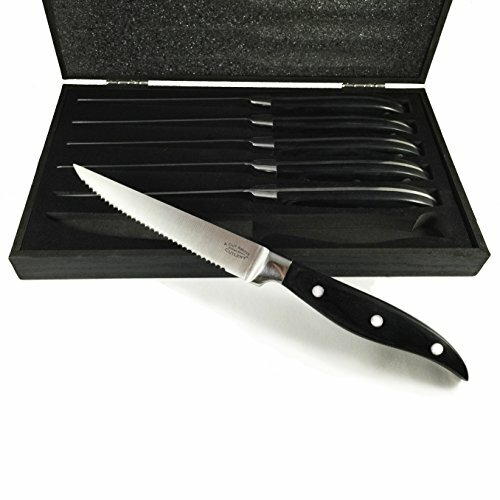 They have beautiful riveted carved wooden handles and the blades are stainless steel and have very sharp serrated edges that never need sharpening. These are some super sharp knifes !! We have steak all the time for dinner especially in the summer when i'm so busy with everything else ( they are fast lol ) and these will slice threw one like its butter and they come with a 5 year warrenty ... who doesn't love that ! Would recommend to all my family n friends and thinking about ordering another set as a christmas present for the new couple .... I received my knife set at a discount for my honest and unbiased review. Looks like a great steak knife.